If you rely on Gmail as much as I do, you probably worry about someone hacking into it right? Well, among the advanced features on Google’s mailing service there is a cool little trick that you can use to monitor “foreign” activity on your accounts. The tip is coming from Make Use Of, and it is really easy to use. 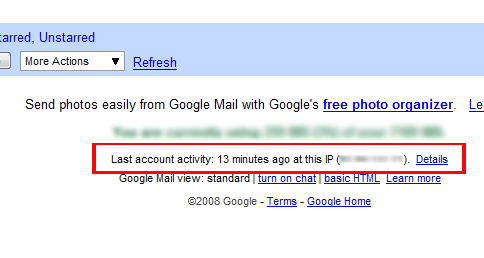 You basically just need to check the bottom of your Gmail account for the “Last activity…” message. There you will see when the last login was effectuated, and using which IP address. You can also click on “Details” to see a list of the last logins, their IP address, browser and so on. All you need to do, therefore, is to check if you are really the only person using your Gmail account! I receive all my gmail via a POP account in Outlook Express. In which case your method of monitoring does not work. I prefer POP mail so I don’t have to put up with all the advertisements. I just want my email, nothing else.